Difference between revisions of "Dudjom Incarnation Line"
*9. '''[[Katok Dampa Deshek|Dampa Deshek]]''' (1122-1192 CE): He was founder of Kathog Gompa in Kham, Eastern Tibet. *10. '''Palden Ling Je Repa''': one of the founders of the Drukpa Kagyu school. *11. '''Sakya Trizin Chogyal Phakpa''' (1235-1280 CE): nephew of Sakya Pandita, ruler of much of Tibet during the Yuan dynasty, priest to Kubilai Khan. *11. '''[[Chögyal Pakpa|Sakya Trizin Chogyal Phakpa]]''' (1235-1280 CE): nephew of Sakya Pandita, ruler of much of Tibet during the Yuan dynasty, priest to Kubilai Khan. *12. '''Drum khar Nagpopa''': Khampa yogi who meditated in dark retreat for 18 years. *13. '''Hewa Chojung''': Khampa magician and subjugator of enemies of the dharma. 1. Yogi Nuden Dorje Chang: tutor of 1,000 princes who, countless ages ago during the aeon of the Buddha Pranidhanaraja, vowed to appear as Sugata Mopa Od Thaye the 1,000th and the last Buddha of this Light Aeon. 2. Shariputra: foremost disciple of Sakyamuni Buddha known for his wisdom. He performed the role of the speaker in many sutras, particularly the Prajnaparamita sutras. 3. Saraha: first of the of eighty-four great Siddhas of India, a poet and a tantric practitioner whose teachings were passed down and who was famous for his spiritual songs (dohas). 6. Khye'u Chung Lotsawa: translator and one of Padmasambhava's Twenty-five Tibetan disciples. 7. Smritijnana: one of the Indian Panditas who established Buddhism in Tibet. 8. 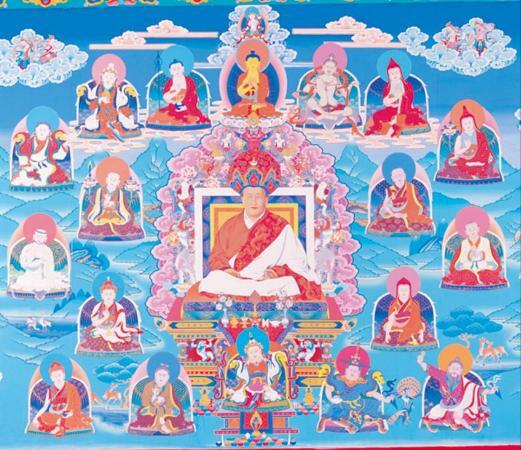 Rongdzom Pandita Chokyi Zangpo: the first to compose major written treatises within the Nyingma tradition. The Nyingma kama was systemetised, explained and received clear commentaries. 9. Dampa Deshek (1122-1192 CE): He was founder of Kathog Gompa in Kham, Eastern Tibet. 10. Palden Ling Je Repa: one of the founders of the Drukpa Kagyu school. 11. Sakya Trizin Chogyal Phakpa (1235-1280 CE): nephew of Sakya Pandita, ruler of much of Tibet during the Yuan dynasty, priest to Kubilai Khan. 12. Drum khar Nagpopa: Khampa yogi who meditated in dark retreat for 18 years. 13. Hewa Chojung: Khampa magician and subjugator of enemies of the dharma. 14. Trakthung Dudul Dorje (1615-1672 CE): the Terton who revived Kathok Monastery in Puwo (South-East Tibet). 15. Gyeltse Sonam Detsen: as head of Kathok Gompa he restored and preserved the tradition of the Monastery. 16. Dudul Rolpa Tsal: yogi, teacher of Jigme Lingpa (1730-1798 CE). 17. Dudjom Lingpa Garwang Dudjom Pawo (1835-1904 CE): born in Chagkong in Kham in Gili from a family of tantrikas. He was a Gili Terton, a Phurba terton well known for magical powers and wrathful countenence. 18. Dudjom Rinpoche, (1904-87 CE).